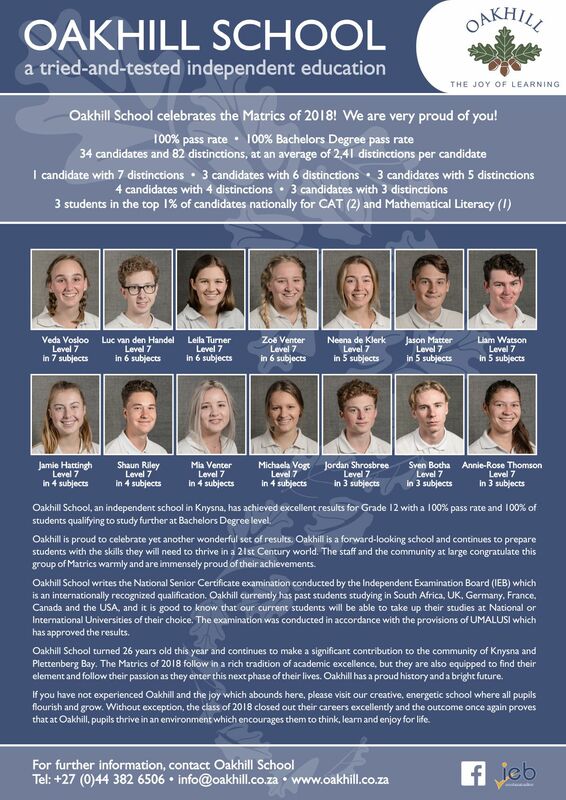 Two Oakhill College pupils qualified as finalists for Junior Sportswoman of the Year at the 2018 Eden Sports Awards – Aimee Canny (Grade 8) and Sophia Trollip (Grade 10). Aimee and Sophia attended the gala event at the Oudtshoorn Civic Centre on Friday, 27 July, which was hosted by the Department of Cultural Affairs and Sport (DCAS) and the Eden Sport Council, in partnership with the Oudtshoorn Municipality. The annual Eden Sports Awards honour the hard work and dedication to sport by athletes from the region. Aimee is currently ranked 1st in South Africa for 50m and 100m freestyle. In the July school holidays, Aimee competed in the Mare Nostrum Series in Monaco, which featured some of the world’s best swimmers, including Katinka Hosszu and Missy Franklin. Aimee finished 4th in the B-Final for both the 50m and 100m Free. She then spent four days in Italy on a training camp with Graham Hill – the Head Coach of South African Swimming. Aimee ended the tour by doing an International Club Gala and achieved 1 x 2nd place and 2 x 4th places in an Open Age Group category. Also in the July holidays, Sophia attended an U16 SA Water Polo squad training session after playing in the CANA Zone IV Tournament earlier this year. In addition to Sophia’s national and provincial representation in water polo, she also has 4 years of provincial hockey under her belt.